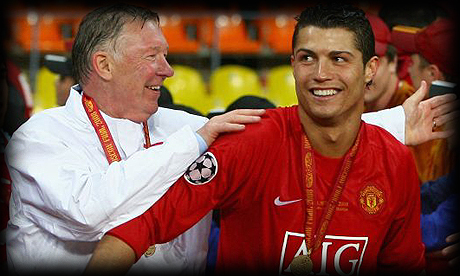 26.05.2011 » Alex Ferguson: "If I could I would bring Cristiano Ronaldo back to MU"
Manchester United legendary coach and manager, Sir Alex Ferguson, said recently to his friend Marcelo Lippi that he would receive Cristiano Ronaldo back at Manchester United with arms wide open. CR7 played for 6 years in Old Trafford, before moving to Real Madrid in a world record transfer fee of 80 Million pounds (94 Million Euros). Manchester United will play against Barcelona in the UEFA Champions League, this Saturday, but Sir Alex Ferguson is still paying attention to Cristiano Ronaldo development. Manchester United has succesfully managed to recover from the Cristiano Ronaldo transfer back in June 2009, but there are no doubts that the Red Devils will always have a place for CR7, if or when the time comes. The former Italian coach, Marcelo Lippi, who was World Champion in 2006, revealed recently to the Daily Telegraph that Sir Alex Ferguson told him that he's waiting for Cristiano Ronaldo to return to Manchester United. However, that's a very unlikely scenario at the moment, since CR7 is very happy at Madrid and he's still attempting to win La Liga and the Champions League as a "Merengue" player. Marcelo Lippi: "Sir Alex Ferguson told me, that if he could, he would bring Cristiano Ronaldo back to Manchester United tomorrow." Lippi also admitted that he shares Ferguson opinion about CR7, by agreeing that the Portuguese is definately an "extraordinary player, who can play either as a winger or as a striker in the middle". Lippi: "What's great about Cristiano Ronaldo is that he always end up by scoring goals." Cristiano Ronaldo was awarded the Fifa World Best Player of the World in 2008, when still playing for Manchester United and after having scored 42 goals in that season. This season, CR7 scored 54 (53 if we don't consider the goal deflected on Pepe) goals this season and broke the Spanish La Liga goal record with 41 (40) goals. Cristiano Ronaldo joined the Portuguese National Team today and will start preparing the match against Norway in the 4th of June. You can watch Portugal vs Norway game livestreams here on this site.